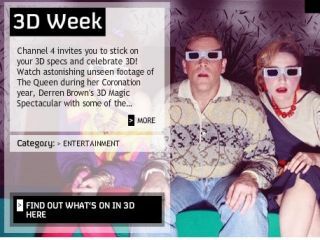 Sky has blasted Channel 4 for giving viewers the wrong idea about 3D, with the channel using aging red-and-blue style glasses to promote its 3D week, which commences today. The dated anaglyph technology is still an interesting gimmick for many viewers, but in comparison to the latest developments in 3D tech it really does not offer the viewer a very satisfying experience at all. Hence Sky has expressed its concerns that Channel 4's 3D Week might give the wrong idea about its own forthcoming 3D TV tech, scheduled for release sometime later next year. A Sky rep told T3 that viewers should be clear that despite Channel 4's celebration of the 20-year-old 3D technology the 3D experience has "moved on considerably from the red and green glasses of the 1980s." They added: "Sky is currently using similar polarisation technology to that being employed very successfully in many of today's cinemas. It's a rich, immersive experience and one which we believe has a commercial future, hence our commitment to launch a channel next year." The Sky rep also told T3 that they would "welcome the opportunity for those experimenting with 3D to share content with us, so we can put it through its paces over a 21st century 3D infrastructure, to whet their appetite for the opportunity ahead."